Is De Réir a Chéile a Thógtar Caisleán: Blag Gnó! Bhí formhór bunluachanna ACLAÍ agam i mo chloigeann le píosa, ach is rud eile iad a chur ar pháipéar. Mholfainn d’éinn atá ag toiseacht gnó na bunluachanna a dhaingniú ón tús ar fad. Go deimhin, ba chóir go mbeadh bunluachanna agat mar duine chomh maith! Pé scéal é, seo agaibh bunluachanna ACLAÍ! · Daoine a spreagadh tríd obair chura, agus nuálaíocht. · Clú láidir agus deimhneach a chothú go leanúnach. Agus sin é! Cuirigí bhur mbariúil in iúil maidir leis na bunluachanna le nóta tráchta mas mian libh. I think I had most of ACLAÍ’s core values in my head for quite some time, but it’s a whole other thing to get them on paper. I would definitely advise anyone who is starting a business to get the core values nailed form the start. Indeed, you should have core values as a person as well! Anyway, here are ACLAÍ’s core values! And that’s a wrap for today! Let me know what you think of the core values by leaving a comment. PS here is the link for the paper. Gan an sprioc, bheadh muid ag siúl thart i gciorcal agus meabhraill orainn. An tseachtain seo tá mé ag obair ar an plean gnó do ACLAÍ. Bhí plean agam i gcónaí i mo chloigeann maidir le forbairt an ghnó, ach ní mór go mbeadh plean daingean gnó agam. Measaim go dtabharfaidh sé treor dom, agus beidh gach rud níos soilléire. Chomh maith le seo, beidh an plean thar a bheith tábhachtach má bhí mé ag cuartú deontas nó iasacht ó maoinaitheoir. Rinne mé roinnt taighde ar an ábhar ar chóir a chur isteach i bplean gnó. Suíomh maith ag Bord Fiontar Chathair Chorcaigh. http://www.corkceb.ie/. Tá mé ag dul úsáid a bhaint as an format atá acu siúd agus mé ag leagan amach an phlean. Tá an fhoirm le feiceáil thíos. Tiocfaidh mé arais le tuairisc ar an dhul chun cinn go luath! Without a goal, we would be wondering around in circles. This week I am writing the business plan for ACLAÍ. I always had a plan in my head for the business, but I need more than that now. I need a solid plan for the development of the business. The plan wil give me direction, will make everything much clearer, and will also prove useful for any potential investor in the business. I did a bit of research on what should be in the business plan. Cork City Enterprise board have a decent site. http://www.corkceb.ie. I am going to use the template that they have on their site, that can be seen in the link below. I will be back with a progress update soon! Bíonn mí Eanair i gcónaí gnóthach i aclainn ar fud an domhan le daoine atá ag iarraidh toiseacht ag aclaíocht agus ag ithe go sláintiúil. Tá mé ag cur pácaiste iontach tarraingteach le chéile fá láthair dár gcuid cuitiméirí ag ACLAÍ le toiseacht i mí Eanair. Neart oibre i gceist leis ach is é an t-ullmhúchán an píosa is deacra! Seo an póistéir don chúrsa go dtí seo do Kick-Start 2012. Má tá aon aischothú agaibh, scaoil amach é! January is always a busy tim in gyms all over the world with people starting to exercise and eat healthy. 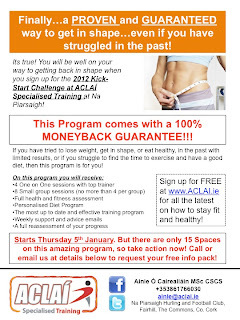 I am putting together a very attractive offer for our customers at ACLAÍ to start in the new year. There is a lot of work involved here, but the prep is always the hardest. 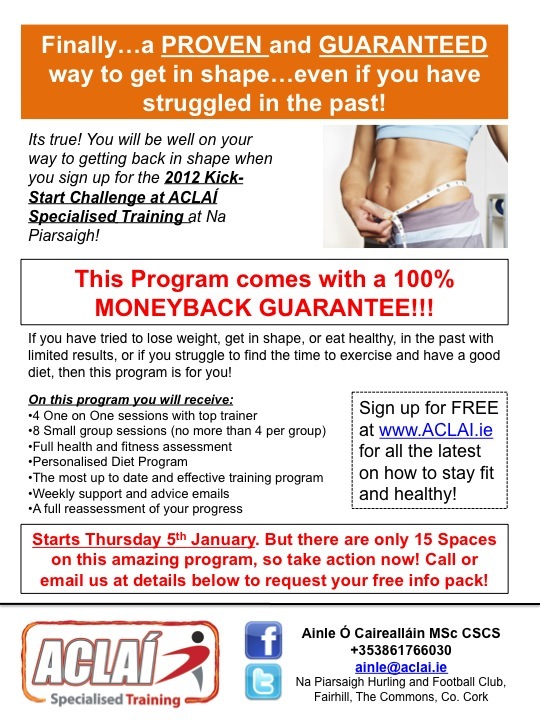 Here is the poster for the Kick-Start 2012 program so far. if you have any feedback, let it out! Beannachtaí daoibh a chairde Gael. Tá athrú tagtha ar ACD! Tá gnó nua a thoiseacht agam faoi láthair, agus na sonraí le feiceáil ag www.aclai.ie go luath. Beidh eolas saibhir ar fáil go flúirseach ar an suíomh maidir le bheith foláin, sláintiúi, agus aclaí! As seo amach beidh tú in ann dul chun cinn ACLAÍ a leanstan anseo ar ACD. Mar atá a fhios againn uilig, tá cúrsaí eacnamaíochta go holc faoi láthair, mar sin beidh sé ina dhúshlán mór an gnó seo a chur ag dul agus a fhás. Coinnigí siúl amach anseo leis an dul chun cinn is déanaí a fháil. ACD has undergone big changes! I am currently starting a new business venture, of which you can find the details on ww.aclai.ie very soon. There will be a wealth of free information here about being fit, healthy, and athletic! From now on, you will be able to follow the grown of ACLAÍ right here on ACD. As well all know, the economic situation is not the best at the moment, so its going to be a big challenge growing this business. Keep the eyes peeled for the latest developments of ACLAÍ! An Béile is Tábhachtaí!/ The Most Important Meal! Deirtear gub é an briscfeasta an béile is tábhachtaigh den lá uilig. Más ea, ba chóir déanamah cinne go bhfuil tú ag baint tairbhe as an chothú a thugann tú duit féin ar maidín. Ní féidir leite a bhualaldh le bata mór, ach go minic bíonn daoine braon de bheith ag ithe leite leis féin. Seo oideas beag deas a chuirfeas an blas arais i do bhricfeasta duit. Bain sult! They say that breakfast is the most important meal of the day. If so, you should take care that you are taking full advantage of the feed time. Porridge cant be beaten in terms of nutrition and wholesomeness, but people often get bored of eating porridge alone. Below is a quick recipe that will bring the taste back into the breakfast. Enjoy!